What's the deal with Burt Reynolds? The man who was once voted the "Sexiest Man Alive" by People Magazine is now a far cry from what he used to be. 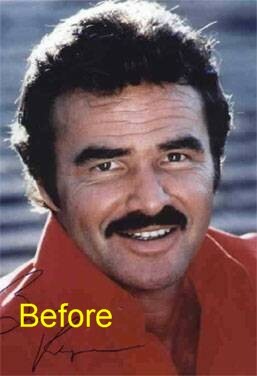 Burt appears to be another classic example of 3-Dimensional Facial Aging treated by 2 Dimensional Techniques. 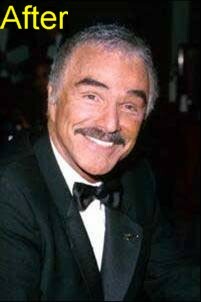 The "Before" photo shows a younger Burt, rugged-looking and handsome. The "After" photo is a more recent photo, and appears to show a number of facial cosmetic surgeries, likely performed using old-fashioned 2 Dimensional Techniques. I'll start with his eyelids and forehead today, and follow up with his probable facelift tomorrow or Tuesday. He appears to have had an old-fashioned browlift where the eyebrows are pulled too high. When this occurs, it is usually done with a long incision from ear to ear which allows removal of a large amount of the scalp. This pulls the eyebrows higher, but appears too high in his case. In addition, he appears to have had an upper blepharoplasty (upper eyelid lift) which has made his eyelids appear a bit beady. The most state-of-the-art browlift is done using endoscopy, or fiberoptic scopes and very small incisions. Patients heal much faster and without the long scar and bald areas which can occur with the older techniques. The Endotine system is the most technologically advanced system that will help hold the brow in place to heal. Unfortunately, many plastic surgeons do not use this because of its cost.